The movement descends into litigation. "We can either go and beat him up or we can go to court." WASHINGTON — Activists who organized the dormant Occupy Wall Street movement are suing another activist for control of the main Twitter account, and one of the plaintiffs says there was no other option but to turn to litigation to solve the dispute. The conflict centers around @OccupyWallStNYC, one of the main Twitter feeds that distributed information during the movement's heyday in 2011. 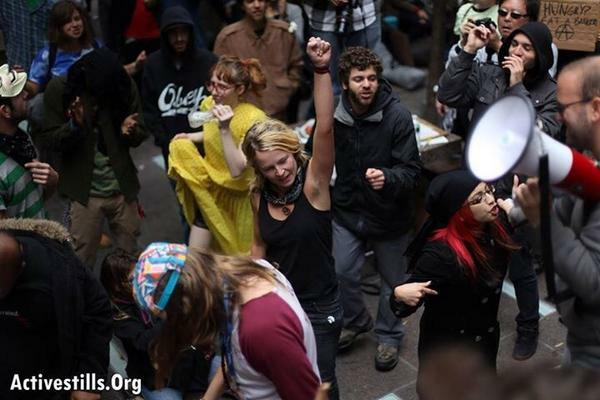 The OWS Media Group filed a lawsuit against organizer Justin Wedes on Wednesday, which is also the third anniversary of the beginning of Occupy Wall Street. The group, led by activist Marisa Holmes, is seeking control of the Twitter account as well as $500,000 in damages. A thread about "self-promotion" became just another shaming session. If we start from a place of assuming bad intentions – i.e. discouraging "self-promotion" over encouraging solid, relevant content – we will end up with rules that shame rather than empower. Group members took on the task of limiting others to "1 to 2 tweets per day" (or week) on a topic, a form of censorship that would never have been allowed in the earlier days of the boat. I had to say enough! "We can either go and beat him up or we can go to court," Holmes, a video editor who was part of the core organizing team of Occupy, told BuzzFeed News. "And quite frankly if we go and beat him up then we could end up with countersuits against us, and that puts us in a more damaging position and we don't really want to do that anyway." "So this is actually the least harmful for ourselves and him given the fact that he won't give up the account without any kind of punitive measure," Holmes said. Holmes said that there had been numerous attempts to get control of the Twitter feed from Wedes, and that suing him was a last resort. "I've given him many many chances and so have a lot of other people," she said. "For the last six weeks there have been conversations online, mainly on Facebook and through intermediaries." "There has been conversation about it and Justin knew he was going to get sued." She accused him of using the feed for his own projects, especially his activism surrounding water rights in Detroit. His taking control of the account is "equivalent to someone running off with a bunch of money or selling off assets," she said. This is the second time in the past year that there have been major fights over control of Occupy's still-extant social media accounts, though the movement has for all intents and purposes died. Activists clashed in February over the @OccupyWallSt Twitter account, which was wrested away from other activists by Google engineer Justine Tunney, who claimed to have founded the account. Wedes did not return requests for comment.